For intermediate or advanced Java programming courses in departments of Computer Science, CIS, MIS, IT, Business, and Continuing Education. Expanding on the world's best-selling Java textbook, Advanced Java™ 2 Platform How to Program includes an in-depth discussion of advanced topics, aiding developers in producing significant, scalable Java applications and distributed systems. 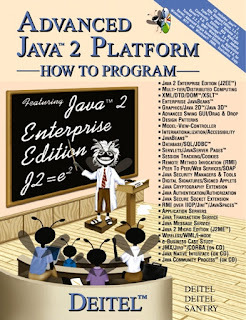 Primarily based on Java 2 Enterprise Edition (J2EE) 1.2.1, Advanced Java™ 2 Platform How to Program integrates many technologies such as Extensible Markup Language (XML), JavaBeans, Security, Java Database Connectivity (JDBC), JavaServer Pages (JSP), servlets, Remote Method Invocation (RMI) and Enterprise JavaBeans (EJB) into a production-quality system that allows developers to benefit from the leverage and platform independence provided by the Java 2 Enterprise Edition. The book also features the development of a complete, end-to-end e-business solution using advanced Java technologies. Introduction. Architecture of the Book. Tours of the Book. Running Example Code. Design Patterns. 2. Advanced Swing Graphical User Interface Components. Introduction. WebBrowser Using JEditorPane and JToolBar. Swing Actions. JSplitPane and JTabbedPane. Multiple-Document Interfaces. Drag and Drop. Internationalization. Accessibility. Internet and World Wide Web Resources. Introduction. Model-View-Controller Architecture. Observable Class and Observer Interface. JList. JTable. JTree. 4. Graphics Programming with Java 2D and Java 3D. Introduction. Coordinates, Graphics Contexts and Graphics Objects. Java 2D API. Java 3D API. A Java 3D Case Study: A 3D Game with Custom Behaviors. 5. Case Study: Java 2D GUI Application with Design Patterns. Introduction. Application Overview. MyShape Class Hierarchy. Deitel DrawingModel. Deitel Drawing Views. Deitel Drawing Controller Logic. DrawingInternalFrame Component. ZoomDialog, Action and Icon Components. DeitelDrawing Application. Introduction. Using Beans in Forte for Java Community Edition. Preparing a Class to be a JavaBean. Creating a JavaBean: Java Archive Files. JavaBean Properties. Bound Properties. Indexed Properties and Custom Events. Customizing JavaBeans for Builder Tools. Internet and World Wide Web Resources. Introduction. Ancient Ciphers to Modern Cryptosystems. Secret-Key Cryptography. Public-Key Cryptography. Cryptanalysis. Key Agreement Protocols. Key Management. Java Cryptography Extension (JCE). Digital Signatures. Public-Key Infrastructure, Certificates and Certification Authorities. Java Policy Files. Digital Signatures for Java Code. Authentication. Secure Sockets Layer (SSL). Java Language Security and Secure Coding. Internet and World Wide Web Resources. 8. Java Database Connectivity (JDBC). Introduction. Relational-Database Model. Relational Database Overview: The books Database. Structured Query Language (SQL). Creating Database books in Cloudscape. Manipulating Databases with JDBC. Case Study: Address-Book Application. Stored Procedures. Batch Processing. Processing Multiple ResultSets or Update Counts. Updatable ResultSets. JDBC 2.0 Optional Package javax.sql. Internet and World Wide Web Resources. Introduction. Servlet Overview and Architecture. Handling HTTP get Requests. Handling HTTP get Requests Containing Data. Handling HTTP post Requests. Redirecting Requests to Other Resources. Session Tracking. Multi-Tier Applications: Using JDBC from a Servlet. HttpUtils Class. Internet and World Wide Web Resources. Introduction. JavaServer Pages Overview. A First JavaServer Page Example. Implicit Objects. Scripting. Standard Actions. Directives. Custom Tag Libraries. Internet and World Wide Web Resources. 11. Case Study: Servlet and JSP Bookstore. Introduction. Bookstore Architecture. Entering the Bookstore. Obtaining the Book List from the Database. Viewing a Book's Details. Adding an Item to the Shopping Cart. Viewing the Shopping Cart. Checking Out. Processing the Order. Deploying the Bookstore Application in J2EE 1.2.1. 12. Java-Based Wireless Applications Development and J2ME. Introduction. WelcomeServlet Overview. TipTestServlet Overview. 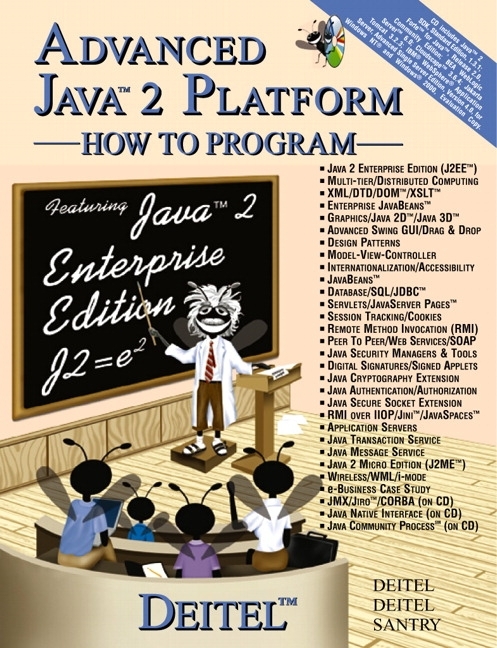 Java 2 Micro Edition. Installation Instructions. World Wide Web Resources. Introduction. Case Study: Creating a Distributed System with RMI. Defining the Remote Interface. Implementing the Remote Interface. Compiling and Executing the Server and the Client. Case Study: Deitel Messenger with Activatable Server. Internet and World Wide Web Resources. 14. Session EJBs and Distributed Transactions. Introduction. EJB Overview. Session Beans. EJB Transactions. Internet and World Wide Web Resources. Introduction. Entity EJB Overview. Employee Entity EJB. Employee EJB Home and Remote Interfaces. Employee EJB with Bean-Managed Persistence. Employee EJB with Container-Managed Persistence. Employee EJB Client. Internet and World Wide Web Resources. Introduction. Installation and Configuration of J2EE 1.3. Point-To-Point Messaging. Publish/Subscribe Messaging. Message-Driven Enterprise JavaBeans. 17. Enterprise Java Case Study: Architectural Overview. Introduction. Deitel Bookstore. System Architecture. Enterprise JavaBeans. Servlet Controller Logic. XSLT Presentation Logic. 18. 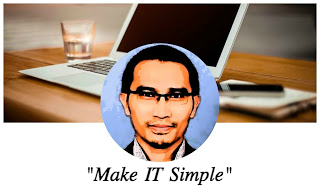 Enterprise Java Case Study: Presentation and Controller Logic. Introduction. XMLServlet Base Class. Shopping Cart Servlets. Product Catalog Servlets. Customer Management Servlets. 19. Enterprise Java Case Study: Business Logic Part 1. Introduction. EJB Architecture. ShoppingCart Implementation. Product Implementation. Order Implementation. OrderProduct Implementation. 20. Enterprise Java Case Study: Business Logic Part 2. Introduction. Customer Implementation. Address Implementation. SequenceFactory Implementation. Deitel Bookstore Application Deployment with J2EE. Introduction. J2EE Specification and Benefits. Commercial Application Servers. Deploying the Deitel Bookstore on BEA WebLogic. Deploying the Deitel Bookstore on IBM WebSphere. Internet and World Wide Web Resources. Introduction. Installing Jini. Configuring the Jini Runtime Environment. Starting the Required Services. Running the Jini LookupBrowser. Discovery. Jini Service and Client Implementations. Introduction to High-Level Helper Utilities. Internet and World Wide Web Resources. Introduction. JavaSpaces Service Properties. JavaSpaces Service. Discovering the JavaSpaces Service. JavaSpace Interface. Defining an Entry. Write Operation. Read and Take Operations. Notify Operation. Method snapshot. Updating Entries with Jini Transaction Service. Case Study: Distributed Image Processing. Internet and World Wide Web Resources. 24. Java Management Extensions (JMX) (on CD). Introduction. Installation. Case Study. Internet and World Wide Web Resources. Introduction. Installation. Starting Jiro. Dynamic vs. Static Services. Dynamic Services. Static Services. Dynamic Service Deployment. Management Policies. Closing Notes on the Printer Management Solution. Internet and World Wide Web Resources. 26. Common Object Request Broker Architecture (CORBA): Part 1 (on CD). Introduction. Step-by-Step. First Example: SystemClock. Technical/Architectural Overview. CORBA Basics. Example: AlarmClock. Distributed Exceptions. Case Study: Chat. Comments and Comparisons. Internet and World Wide Web Resources. 27. Common Object Request Broker Architecture (CORBA): Part 2 (on CD). Introduction. Static Invocation Interface (SII), Dynamic Invocation Interface (DII) and Dynamic Skeleton Interface (DSI). BOAS, POAs and TIEs. CORBAservices. EJBs and CORBAcomponents. CORBA vs. RMI. RMIMessenger Case Study Ported to RMI-IIOP. Future Directions. Internet and World Wide Web Resources. 28. Peer-to-Peer Applications and JXTA. Introduction. Client/Server and Peer-to-Peer Applications. Centralized vs. Decentralized Network Applications. Peer Discovery and Searching. Case Study: Deitel Instant Messenger. Defining the Service Interface. Defining the Service implementation. Registering the Service. Find Other Peers. Compiling and Running the Example. Improving Deitel Instant Messenger. Deitel Instant Messenger with Multicast Sockets. Introduction to JXTA. Internet and World Wide Web Resources. 29. Introduction to Web Services and SOAP. Introduction. Simple Object Access Protocol (SOAP). SOAP Weather Service. Internet and World Wide Web Resources. Appendix A. Creating Markup with XML (on CD). Introduction. Introduction to XML Markup. Parsers and Well-Formed XML Documents. Characters. CDATA Sections and Processing Instructions. XML Namespaces. Internet and World Wide Web Resources. Appendix B. Document Type Definition (DTD) (on CD). Introduction. Parsers, Well-Formed and Valid XML Documents. Document Type Declaration. Element Type Declarations. Attribute Declarations. Attribute Types. Conditional Sections. Whitespace Characters. Internet and World Wide Web Resources. Appendix C. Document Object Model (DOM) (on CD). Introduction. DOM with Java. Setup Instructions. DOM Components. Creating Nodes. Traversing the DOM. Internet and World Wide Web Resources. Appendix D. XSL: Extensible Stylesheet Language Transformations (XSLT) (on CD). Introduction. Applying XSLTs with Java. Templates. Creating Elements and Attributes. Iteration and Sorting. Conditional Processing. Combining Style Sheets. Variables. Internet and World Wide Web Resources. Appendix E. Downloading and Installing J2EE 1.2.1 (on CD). Appendix F. Java Community ProcessSM (JCP) (on CD). Introduction. Participants. Java Community Process. Appendix G. Java Native Interface (JNI) (on CD). Introduction. Getting Started with Java Native Interface. Accessing Java Methods and Objects from Native Code. JNI and Arrays. Handling Exceptions with JNI. Internet and World Wide Web Resources. Appendix H. Career Opportunities (on CD). Introduction. Resources for the Job Seeker. Online Opportunities for Employers. Recruiting Services. Career Sites. Internet and World Wide Web Resources. Appendix I. Unicode (on CD). Introduction. Unicode Transformation Formats. Characters and Glyphs. Advantages/Disadvantages of Unicode. Unicode Consortium's Web Site. Using Unicode. Character Ranges.